Today I have a card share for Easter, an Easter Bunny Punch Card. I love cards made with punches. These cards are great since you can use up your little scraps to make the pieces. The other thing that I like about cards made with punches is they can be used each year with new papers. 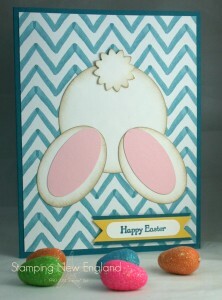 This card uses a circle made cut from white card stock for the bunny’s body. The edges of the circle have been sponged with soft suede to add a touch of color to the body. The feet are made from the extra large oval punch cut from white cardstock. The inside of the feet is punched from the large oval punched from pink pirouette card stock. The bunny’s tail is punched from the triple flower punch. The message Happy Easter is from the word set Teeny Tiny Wishes. The cardstock base is Island Indigo. Also – don’t forget about the specials for this week!